ATHENS - The Georgia football team held its 12th practice of the spring and second scrimmage on Saturday afternoon, working out in full pads for two hours in Sanford Stadium. 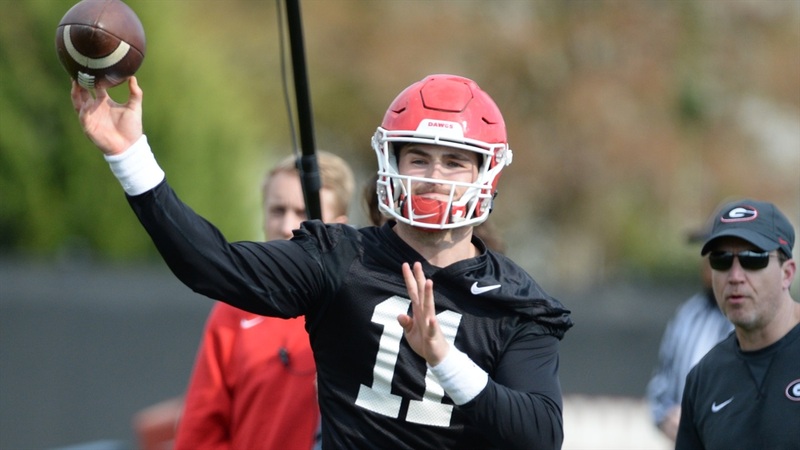 The Bulldogs will continue practice through the team’s G-Day spring scrimmage game on Saturday, April 20 at 2 p.m.
"I mean, that’s just— I thought defense played hard. It’s just ebb and flow. Somebody’s going to make a play. I’m concerned about the whole team. I mean, I’m concerned about the offense. I’m concerned about the defense. I’m concerned about the depth. I’m concerned about the field goals. I’m concerned about everything. I think, as a coach, you have to be concerned about everything. The offense probably outperformed everybody— I mean, the offense outperformed the defense today." "Well, I mean, it’s trying to find the best tackles. I mean, we’ve got guards— Cade (Mays) is playing left tackle, Cade’s playing right guard. Owen Condon has gotten stronger, more physical, is playing with more confidence. D'Marcus Hayes is playing out there. (Warren) McClendon was in on more reps today. So, you’re always looking to find tackles, and we’re trying to find the best lineup A, best lineup B, best lineup C; you could go all the way to Z with all the combinations and the multiples that could be created by injuries. So, we don’t ever want to not have a player as good as another guy out there, so Jamaree (Salyer) gives us that luxury on being able to do both." "Justin’s doing a good job. Justin is an experienced player. He’s put a lot of work in, and he’s put a lot of work in in the weight room. Justin is a ‘lunch pail’ guy—hard to move, he understands leverages, he plays with toughness, he plays hard. Usually, when you get a guy who’s a fifth year in a program, that’s what you get. He knows what to expect, and he’s played really hard." "Up and down. We’ve had flashes. We’ve had Azeez Ojulari flash some good rushes and some good effort. I think Jermaine’s flashed some coming back off an ankle injury. Nolan (Smith) plays hard all the time. He doesn’t always play smart, but he plays with great effort and does a good job. And Brenton (Cox) and Robert (Beal) both scrimmaged today, and I think they’re both getting better, but it hasn’t been consistent, and we’re not dominant out there like people ‘quote-unquote’ think we’re the greatest inside linebackers to ever play. We’re not getting by our tackles every down, I know that." "Yeah, I don’t think we’ll really know there until the complete meeting. We’ve got (Brett) Seither coming, too, from Tampa. So, we’ve got a big group coming in there. So, that’ll be— depending on how good those young guys are and if we get anyone else who’s able to help us— that’ll be key. I mean, I’m pleased with Fitz’s work. Fitz works really hard, and he’s blocking really big people, and he’s having to compete against big people for the first time. Last year, he didn’t go up against those type guys. This year, he’s getting thrown into the fire, but he’s competing really hard. Two walk-ons— Kolby Wyatt and Peyton Mercer— are both competing really hard at tightens and thought they both did a good job today." "He's playing tougher. I don't think he was a guy that played a position where had to go block people all the time in high school. Now, he's having to go in-line and block people, flex out, run routes. I think he's in the 240s. He works really hard and our weight program has helped him, as it has helped Owen Condon. It's helped those guys go out there and get more strength. They lift during the season on Fridays and that pays off for them now because they're further along because of all the work they did." "We've had a good spring. I don't know if that's a credit to the young secondary or whether that's a lack of depth at receiver. We probably didn't have our best day today. We gave up some plays on the back end, more than we did last week. Those kids grow and they're growing. What you know is we've got what we're going to have. There's nobody else coming. It's very unique that we have depth and we're able to move people around to try to figure out the best parts. You're really trying to get the guys who don't know what they're doing to be able to do that. There's a few guys that have played a lot of snaps here, with the likes of (Eric) Stokes, Tyson (Campbell), J.R. (Reed) and even Richard (LeCounte). Those four guys have played a lot of snaps. We're trying to get those other guys ready to go play and the good thing is they're here to get these reps. I think that's going to pay off for us in the fall. I think we've got the potential to be a very fast secondary. I don't know how instinctive we are yet, I don't know how great we are at playing the ball, but we do have some great speed back there." "He's a rotational player. He fits with Malik([Herring) and Justin Young. When David (Marshall) gets back, he'll be right there with them. He's good enough to rush outside, can bump inside and hold up. Tramel's a good athlete. I think his head's been swimming some because he doesn't know our defense. He's really like a freshman even though he's in a sophomore's body. He doesn't know some of the words and commands, and I hope when I watch the scrimmage tonight and tomorrow that he played better than he did last week is what I hope."